Is there a place for the expression of bigotry, racism and misogyny in Greater Sudbury? Yes, we tolerate these hateful sentiments among us, because we understand that people have the right to express themselves, even when their expressions are hateful and hurtful. As long as what people are expressing doesn’t cross the line into hate speech, it’s something that we have to live with. But giving those who promote racism, bigotry and misogyny a public podium to promote their hate-filled agendas is something that we really ought not to be doing – not if we truly believe that we should be aspiring to creating a culture of that champions diversity and inclusivity – and especially if we belong to an organization that has a mission statement that lays that all out. Our media has long had to grapple with finding a balance between permitting people to say what they want to say, and restricting access to the public realm because sometimes what people want to say is hateful, hurtful and harmful. I know that editors often think long and hard when they encounter a piece that comes close to the line – to print or not to print? What is in the public’s interest? Generally speaking, our media has been reluctant to provide a public podium to those who engage in the most egregious forms of bigotry, racism and misogyny – even when a letter to the editor is clearly not “hate speech” as defined by the law, but rather just “full of hate”. I characterize it this way: Believe what you want and say what you like. If you’re not engaging in hate speech, those are your rights under our Charter. But don’t expect me to hand you a microphone. You are not entitled to that. Municipalities throughout Canada have adopted various policies wherein they iterate a desire to deliver critical public services to community members in a manner that is free of discrimination and harassment. The City of Greater Sudbury has a Diversity Policy wherein it is described that the City values diversity, equality and inclusion. Barriers, unintended or systemic, that prevent participation in municipal activities, need to be addressed. It’s a pretty good policy. I think that municipal leaders need to dust it off and start taking it seriously. The times are clearly changing. We don’t live in a static world. Instances of bigotry, racism, intolerance and misogyny are entering the public realm like never before. Even before Heather Heyer was killed in Charlottesville this summer, instances of hate – especially hatred directed towards Muslims – were becoming more common (see: “Hate crimes against Muslims in Canada up 60%, StatsCan reports,” CBC News, June 13, 2017). In large part, blame is being laid on the doorstep of right-wing political ideologies that have mainstreamed bigotry and hate. Here in Ontario, other cities, like Kingston and London are leading the way to ensure that their public spaces are free of discrimination and harassment. In Kingston, in response to a hate-filled video posted on social media, the city is launching an anti-discrimination and anti-racism campaign. Kingston Mayor Bryan Paterson writes, “I want to state emphatically that hatred, discrimination and insults based on a person’s race are absolutely unacceptable in our city. Eliminating racism is a community wide effort and will take all of us working together.” (see: “Taking a Stand against Racism in our Community,” Bryan Paterson, August 10, 2017). In London, in response to a rally organized by the racist group Patriots of Canada Against the Islamization of the West (PEGIDA), City Council under the leadership of Mayor Matt Brown adopted a motion of Council, “That civic administration be directed to prepare the necessary formal council policy to confirm the prohibition of activities of organizations whose ideologies is contrary to the City of London are not permitted in civic spaces, and/or facilities and spaces.” The motion hasn’t been without controversy – but the City of London is under no legal obligation to hand out what amounts to a microphone to those promoting racism, bigotry and misogyny (See: “Policy advocate criticizing London council’s emergency motion as an “attack on free speech,” Global News, August 23, 2017). And in Greater Sudbury, we have a member of our municipal Council posing for photographs with members of the anti-Muslim Soldiers of Odin (SOO) wearing their regalia. Unlike Greater Sudbury Police Services Chief Paul Pedersen, who also posed for a photo with the SOO, Councillor Gerry Montpellier hasn’t (to my knowledge) publicly disavowed the photo or the Soldiers of Odin. It’s not like he wasn’t given the chance – when contacted by local media, Montpellier appeared to laugh it all off, stating “I just don't know what to say because it's kind of a funny thing. … What do I say? … We pick up needles. We help seniors. We'll run the soup kitchen. We'll hand out hamburgers. Well, of course I want your help.” (see: “Sudbury police chief apologizes for photo with Soldiers of Odin,” CBC News, August 24, 2017). Councillor Montpellier’s actions and subsequent pseudo-endorsement of the SOO hasn’t sat right with many in the community, including me. But what’s clear to me – and perhaps less so to others in our community – is that our City just isn’t taking the presence of extremist groups in our community particularly seriously. Since the late-August media blitz about the SOO in Greater Sudbury, a number of things have come to light. SOO members have publicly indicated that they have been volunteering at the Blue Door Soup Kitchen. On the surface, that certainly seems like a worthy thing to do. But right-wing extremist groups are known to target the most vulnerable in our communities as a way of recruiting new members, while donning a veneer of public acceptance of their presence. 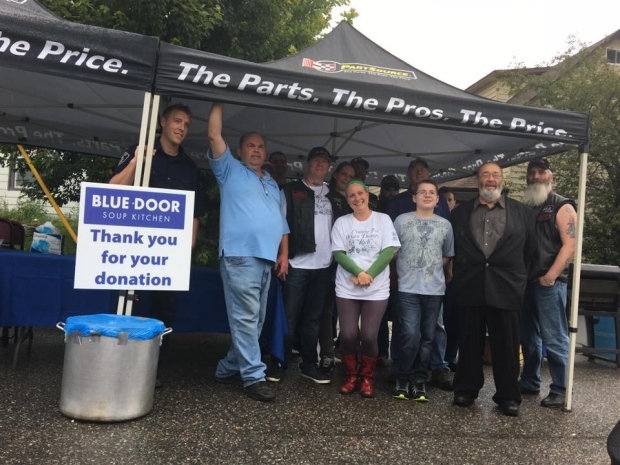 Whereas many other organizations around the City do good deeds without trumpeting their actions on social and mainstream media, it works to the SOO’s advantage to be associated with good public works – it helps mainstream their organization. Of course, so does writing blogposts like this. Keep in mind Oscar Wilde’s famous words about PR: “There is only one thing in life worse than being talked about, and that is not being talked about.” But sometimes, we just have no choice – we’ve got to talk about these things, because the presence of groups that are founded on the principles of hatred just cannot be tolerated in our communities. There is no place for them here. I’m not going to get into all of the specifics about what SOO chapters across Canada have been up to. Others have been documenting the SOO for longer than I’ve been aware of their existence. If you want to know more, here’s a good place to start – and you can read some other articles at Vice too (see: “Tracking the far-right,” Vice News Canada, February 2, 2017). And yes, I understand that the Sudbury Chapter of the SOO takes a very typical Sudbury approach by claiming it’s different, and that the SOO has changed, and that they didn’t change their name because people had spent a lot of money on patches and stuff. I’ve had the misfortune of interacting with a number of Sudbury SOO members on social media, and I know these people are not nice. They use falsehoods to smear their critics, they lace their diatribes with misogynistic language and profanities, and they engage in the tactics of intimidation. Those are hardly the sorts of things that a harmless civic-minded support organization would do. Earlier this summer, I sent a letter to Chantal Mathieu, Director of Environmental Services for the City of Greater Sudbury, alerting her to some of my concerns about SOO members using the City’s public spaces as part of their PR campaign to mainstream their organization (see: “Open Letter to the City of Greater Sudbury Regarding Anti-Muslim Soldiers of Odin in Our Community,” Sudbury Steve May, July 19, 2017). I’ve followed up with Chantal Mathieu twice since July, looking for a response from her to the concerns that I initially raised. I copied my local member of Council. I haven’t received any response from the City on this at all. Nothing. Crickets. Not even an email acknowledging receipt of my email. 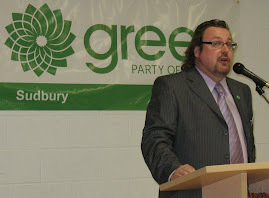 As a member of the Green Party in Sudbury and Nickel Belt, I understand that the City has a policy in place which restricts the use of municipal facilities by political parties, based on the understanding that taxpayers’ money should not be going towards helping out partisan political organizations. I fully support this policy. It’s absolutely fair for the City to restrict the use of its taxpayer-supported facilities to some groups. Again, the City does not have any responsibility to hand the Green Party, or any other political party or candidate, a microphone. And I’m pretty sure that Conservatives, New Democrats, Liberals, Communists and others who pay taxes in this City are pleased to know that their tax dollars aren’t supporting the Green Party’s vegan pot-lucks. I think it’s time that the City of Greater Sudbury follow the lead of the City of London, and expand these taxpayers protections to include other organizations. The City of Toronto took a little flack lately when it was revealed that former members of the odious, racist Heritage Front had booked a room in a library for a wake for a dead lawyer who did “some good work” for neo-Nazis (see: “Memorial for lawyer who represented holocaust deniers creates controversy for Toronto Public Library,” CBC News, July 12, 2017). Clearly, the time for a conversation about this is Right Now. And yes, I understand that a municipal park isn’t a library meeting room – but it’s still a restricted municipal facility that’s maintained by the City. It is a public facility, and the City has the ability to restrict the use of parks through by-law. And it does. There are restrictions on timing, restrictions on open fires, even restrictions on smoking. The goal is to make the public facility a safe place for all users, and to limit liability to the City. The safety of users must be paramount. Allowing the public to be exposed to messages of hate at a City-run facility decreases safety for all users. Based on London’s experience, the conversation is going to be an uncomfortable one – when what are perceived by some to be seen as competing sets of rights going to head-to-head, it can certainly make some people nervous – me included. But this isn’t about competing rights. No one in the City of London or elsewhere is suggesting that people shouldn’t be able to engage in hateful speech if they want – they’re only saying that perhaps its time we got serious about our municipal values of diversity and tolerance, and stop offering our taxpayer-funded municipal facilities to organizations that are promoting bigotry, racism and misogyny. Public tax money pays for the maintenance of our municipal facilities, including parks. Public tax money goes into municipal service delivery. Our City has partnerships with organizations and businesses that deliver services. What the SOO’s coming out party this past summer has shown me is that it’s now past time for the City of Greater Sudbury to get serious about Diversity and Inclusivity and the use of taxpayer funding to hand hate groups a microphone for their recruitment efforts. If you agree with me, please let your Council member know. It’s very important that we start this conversation in our community, because the SOO are here and unless we, as a community tell them emphatically that their presence here is not welcome, they’ll remain here. Our City can’t be tacitly supporting the SOO through any means – and most especially by allowing the SOO to use taxpayer-funded municipal facilities and services to promote their anti-Muslim organization.